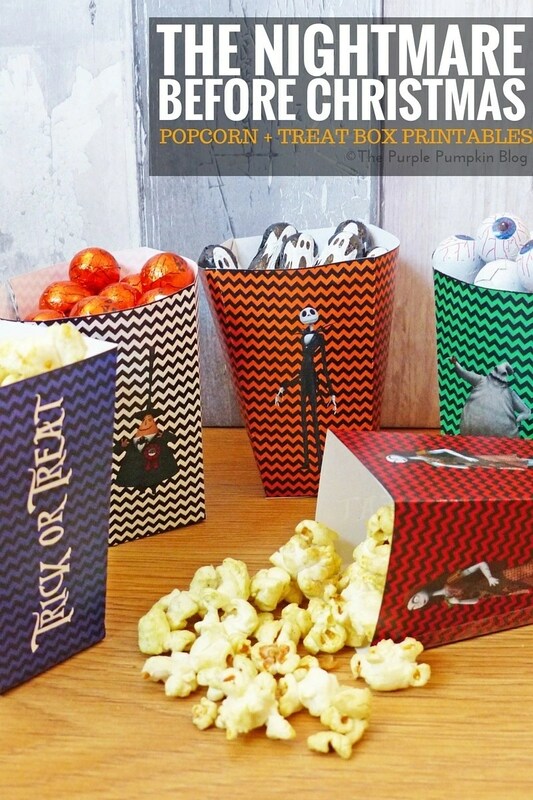 Here is the fifth free printable in my Halloween party set for Crafty October 2015: Popcorn + Treat Boxes – The Nightmare Before Christmas. There are 12 designs in all, across all of the printables in The Nightmare Before Christmas set with the following characters. For the paper chains, I’ve also included blank ones using the 5 coloured chevron backgrounds. Simply click the text links above, or the images below to download a sheet of the character/coloured popcorn and treat boxes that you want. Or you can find them all mixed together in one document here. Print off as many as you need, onto thin card and cut out. Flip over to the blank side, and you can judge where to score some lines to make folding easier: along the bottom flap tabs, the side flap, and along each edge, from point to point. Fold around, and use glue or tape to secure the sides first, then upend, to do the bottom flaps – I find tape easiest to secure these. If you using glue, you may want to add a paper clip to hold everything in place until the glue dries. Fill with popcorn or Halloween treats! Day 15 – See You Real Soon! | Dine Around Disney 2014	I Love My Car!